High quality roofline is an important investment, protecting your property from costly weather damage and saving you the stress of constant repairs and repainting. 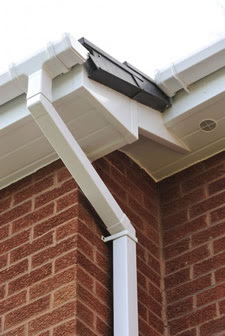 Our range of roofline products work together to maximise your homes resilience to the elements, designed for lasting quality and available in a wide range of designs and styles to match your home. Lindsey Windows only use the finest uPVC roofline products, we take care to remove the old fascia boards and complete all of the finishing touches to protect your home. uPVC roofline products eliminate dry and wet rot and permanently enhances the look and value of your home. There are many different sizes and colours of uPVC, fascia, soffit, guttering and cladding to enable a sympathetic and durable finish, whatever the age of your property. No more painting. No more leaky gutters!